Hello, my name is Zoe and I am 9 years old.Â I live with my Mum, Dad and 4 year old sister Danni in London, United Kingdom.Â I have been making cards now for just over a year and run a challenge blog for kids with my friend Hannah.Â I was so excited when Patricia contacted me and asked me to be her guest designer for August. I made this card for my friend Sophie’s Birthday. She is 9 today! The image is by The Greeting Farm and I have coloured my princess is copic sketch markers. The gorgeous papers are Cotton Candy, Grapesicle and Double Duty Violet. I love these colours and the papers have such yummy names!Â I embossed the two main panels using a cuttlebug and birds and swirls folder. The embellishments used on my card are K&Co stickers. Zoe, you are so talented! 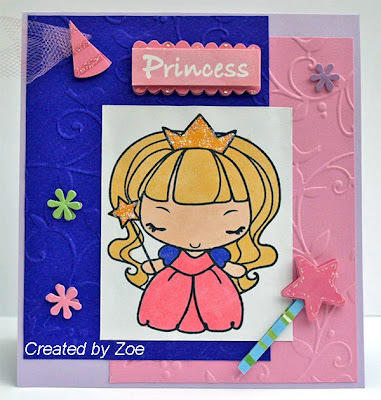 This card is fit for a princess! The colors are so pretty. Zoe, that is soooo cute! You are the PaperPrincess for sure!! Thrilled to have you aboard!! Check out August’s specials and PaperTemptress’s blog! This is so cute! I love the colors.